Continuing our 2008 retrospective of selected cakes... Part 1 can be viewed here. The majority of the cakes below were made in the latter half of 2008, starting with the first cake in the group, which Rick made for the very popular 8-8-8 (August 8, 2008) date. We saw the numbers trend start on 7-7-7, then 8-8-8 and so forth. On 8-8-8, we had a news television camera in our shop who documented the crazy wedding trend while Rick was working on the cakes. It was exciting but always stressful to have to create under those circumstances. The cakes turned out great, and a pretty blue cake with gardenias is shown above. It was Rick's first "messy" cake. Prior to 2008, we didn't know what a "messy" cake was. It was an idea that our client came to us with. She asked Rick to design a cake that looked messy to have at a kids party where there would be arts and crafts for the kids. Our client gave Rick free reign on the design and after giving it some thought, he decided to approach the messy cake from the perspective of a child, imagining how a child might decorate a cake. I recall Rick mentioning that it was a tough design for him to do because he needed the cake to look "messy" but didn't want it to look ugly, like a wreck, and it needed to be done right. 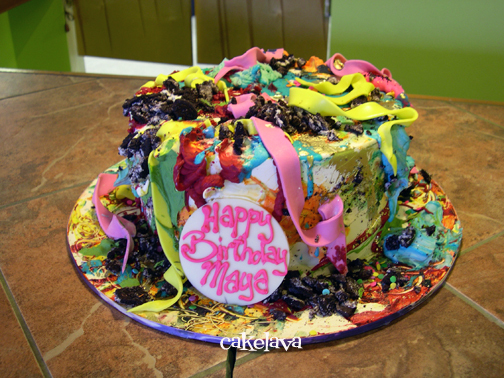 He made an extremely colorful cake for Maya and it was such a hit that the following year our client returned to get another "messy" cake! That next messy cake was done in pretty pastels. I remember this cake well. The bride was from New York and asked for a much smaller version of Rick's and my wedding cake, but done in blue, like one he made a couple years earlier. 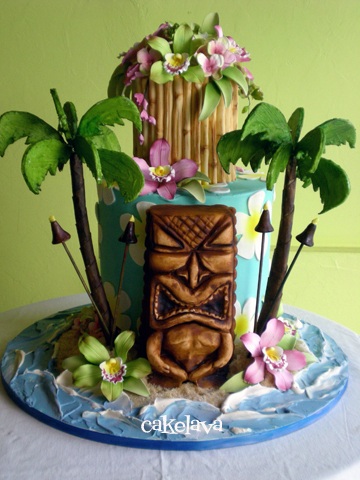 This cake incorporates many of the decorations that cakelava has become known for - the dimensional palm trees, Hawaiian tiki, and the bamboo covered tier. 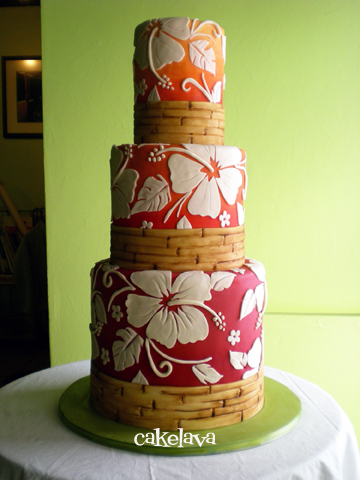 The cake looked stunning in person and has been a requested design overy the years by brides wanting a Hawaiian tiki themed cake. 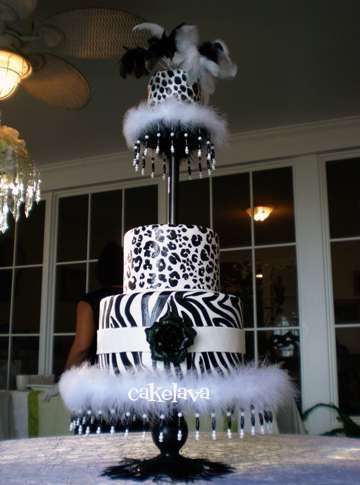 This lovely sophisticated animal print cake was one of our favorites from 2008. The bride worked for a prominent videographer in the wedding industry and had become a huge fan of Rick's cakes after shooting them at weddings. I still recall the letter she sent us asking Rick to make her cake. She was incredibly excited and hoping we would be available. She expressed her desire to have a cake that was very unique and didn't take itself too seriously. She and her fiance wanted a fun cake that their guests would swoon over. Rick selected a cake on a pole for them to give them the drama factor they wanted which also worked great for their black and white color scheme. He painted the three different animal prints by hand on the cake, adding feathers and a soft boa, and columns of black and white delicate beads on the bottom of the tiers and placed it on a porcelain cake stand. 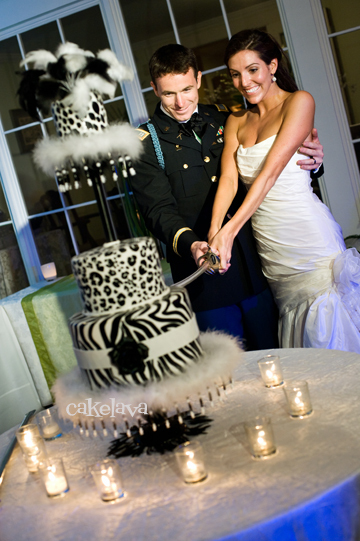 The couple was ecstatic with their one of a kind design and used a sword to cut into their beautiful cake! Visionari took the gorgeous photo! The "Makenna" cake was an instant hit when it was posted on our website. If it wasn't for the size and cost of the cake, Rick would have made this exact cake numerous times. The Makenna cake fed well over 200 people, so the design was very specific and worked best for a large guest count, which not everyone has. From the perspective of the person communicating with the customers, it was a challenge for me to explain that this design wouldn't look the same with a guest count of 50. The proportions would be different, the number of tiers would be different and the squares shape wouldn't translate the same for smaller guest counts. We were really happy with the cake, and most importantly so was the client. 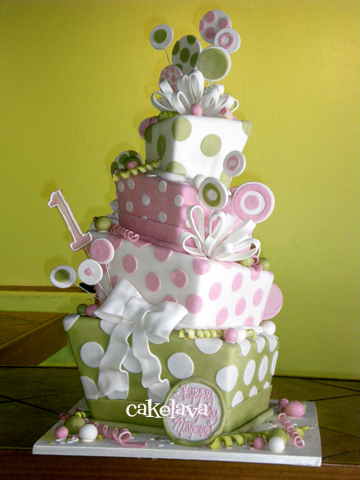 The colors and fun polka dots theme was a fun one to design around! Some cakes seem to appeal to just about every bride and at the time Rick made this cake, many brides were asking for the "Leslie R" cake. 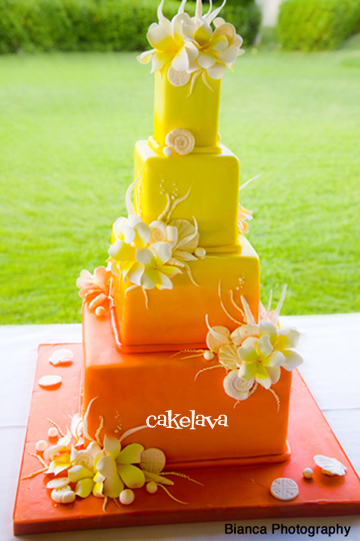 The bright orange and yellow sunset colors had great appeal and worked beautifully with the Hawaiian plumeria flowers and seashells on the cake. 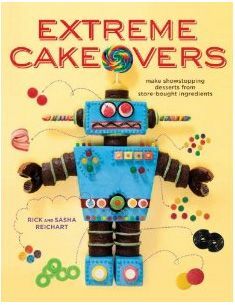 The cake has been featured around the world and even made its way into a book, "1,000 Ideas for Decorating Cupcakes, Cookies & Cakes". The couple have ordered many cakes from us, including a toilet bowl, one of our most unusual designs! Rick has made two sculpted Buddha cakes. He made this Buddha for a very special friend of ours in honor of her birthday, which was celebrated at, of all places, a bowling alley! I wrote about the Buddha cake at the bowling alley experience in detail on the blog. You can read the post here. 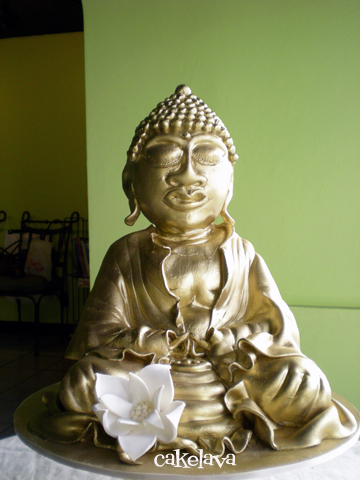 Rick made another Buddha cake with a more voluptuous representation, this time for an NFL player's vow renewal in 2012. You can view the other Buddha cake here. 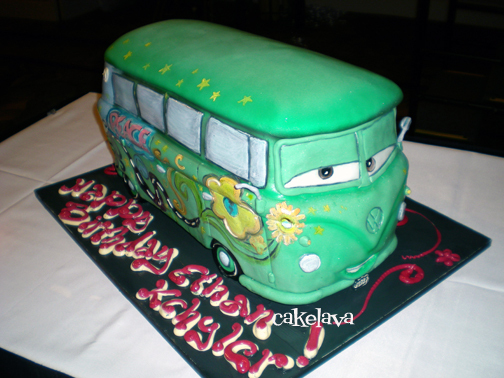 Rick was ecstatic about making the "Fillmore" VW bus cake! He is a huge fan of the VW bus and used to own one. He has great memories of driving his VW bus with his dog in the back. The Fillmore character was right up his alley because there was a lot of handpainting on the bus and it was a fun cake to sculpt. He had made the Lightning McQueen numerous times and also the Towmater, but had been holding out for Fillmore. Eventually, he got his wish! Students who have taken Rick's class in 2011 and 2012 will recognize this cake as the "hibiscus" cake. 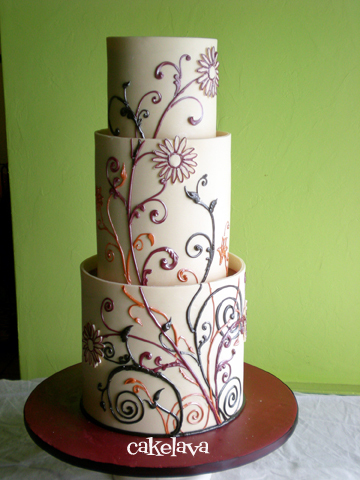 Rick designed this cake in 2008, when we were contacted to make the cake for a wedding that would be featured on a Mark Burnett TV show. 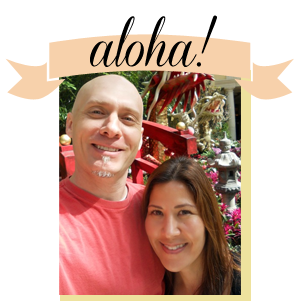 Working with the event designer, Rick was given a color palette: sunset - red, orange and yellow - to be used throughout the wedding and to have the cake be a tropical/hawaiian theme since the couple would be flying to the island to get married. Rick made the cake which we then transported to Maui. At the time there was a ferry operating between the islands which made it possible for us to bring the cake. The sketch above is what Rick drew and presented to the event designer and she loved it. Little did we know then how much of a following in various media after we shared it. When it came time for Rick to choose a cake for his first "Discover Your Inner Artist" class, he chose this one, as we've had so many requests for it over the years! had shifted slightly off-center, so rather than the tier going straight across, it slightly recedes at the halfway point. This was a gorgeous wedding that was featured in Style Me Pretty and a book. 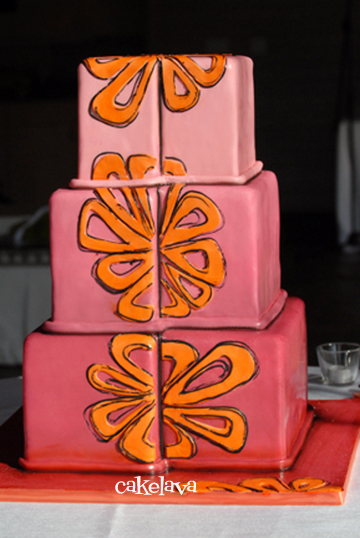 The couple used lots of pinks and oranges in their wedding and had the graphic floral motif found on their cake throughout the wedding. The beautiful photo was taken by Rachel Robertson. It was the first time Rick had made a cake with the tiers done in this way and it made for a dramatic presentation. This design has remained one of my favorites over the years. 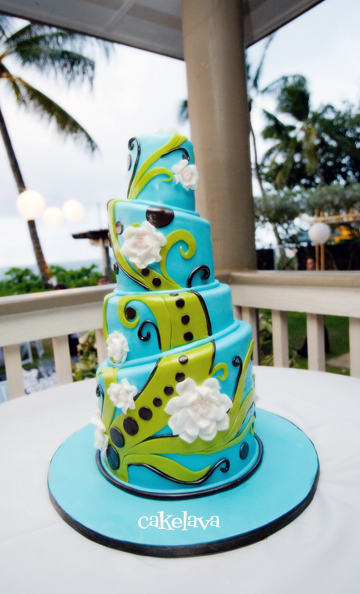 The floral vine pattern on the cake was inspired by the couple's invitation and is piped on the cake. This wedding took place in October 2008. It was at the time, one of the most extravagant, over-the-top weddings we had done and there was over 400 guests in attendance. 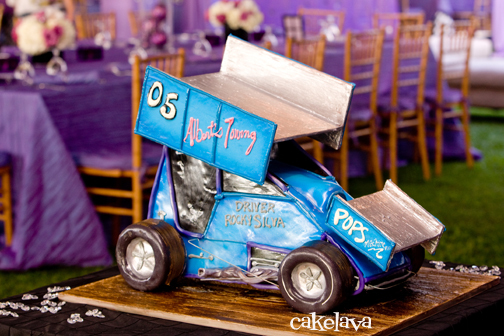 The theme of the wedding was a racing theme, which was integrated into both the wedding cake and groom's cake. At the time, we didn't know what a sprint racing car looked like, and luckily the couple had one and sent Rick photos to work from. It was probably the most difficult car cake Rick had made. 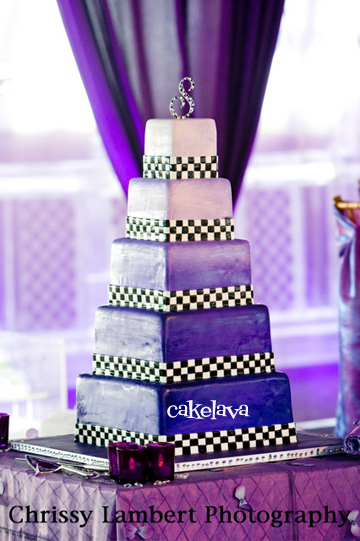 For the wedding cake, he decided on an ombre look with color gradations of purples, with a checkered pattern on the bottom of each tier. It was such a fun, spirited wedding that we will always remember! The bride ordered this cake as a surprise groom's cake for her fiance. 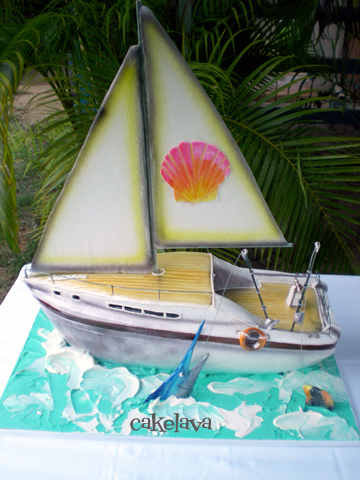 She requested a sculpted boat with a wooden deck and include the shell shown on the sail. Her fiance is a fisherman and asked for fishing poles and a marlin in the water. It was an awesome cake and a great compliment to the more elegant wedding cake with phalaenopsis orchids they ordered. The Fantasia cake! It is one of our all-time favorite cakes Rick made at cakelava. The couple who ordered this cake were HUGE Disney fanatics, and I do mean HUGE! They had a completely Disney-fied wedding, with character centerpieces, a Sleeping Beauty castle at the guests table, and guess where they were headed to for their honeymoon? The Happiest Place on Earth, of course! Rick was given carte blanche on the design. 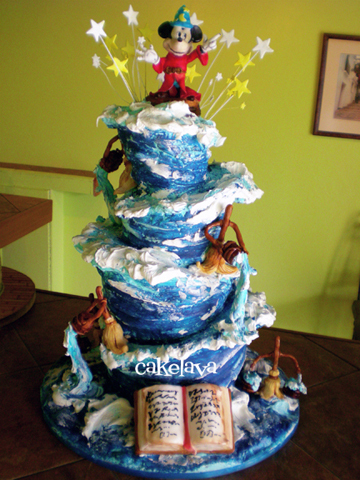 They wanted a "Fantasia" theme cake but it was up to him which scene he wanted to make and how he would do the design. Rick chose the famous water scene and made the Mickey Mouse and all the brooms and buckets by hand. The shapes were wonky and the icing was buttercream. He gave it a painterly look. The couple adored their cake and we were sad to see it leave our studio. 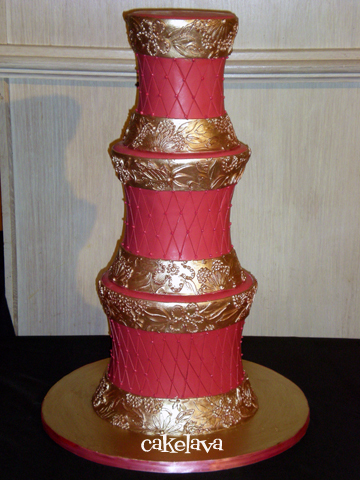 This unusual berry and gold colored cake with the concave shapes was one of the last cakes Rick made in 2008. The design was inspired by the bride's invitation, which featured a gilded etching of a floral pattern, which he added to the cake. The cake was about two and a half feet tall and looked beautiful in the room! Join us for the next post, when we look at 2009, which was a also a very busy year! Hey! I know that couple with the animal print cake! 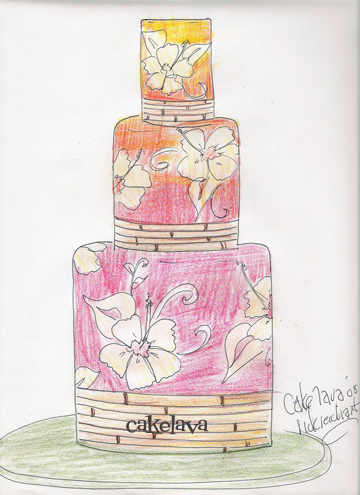 Almost 5 years later, our guests are still talking about the taste and design of our cake! Thanks so much S+R!